Donald Trump Jr. left the door open to a future run for office. He has flirted with running for office in the past. President Donald Trump has dismissed past speculation about his son running for office. 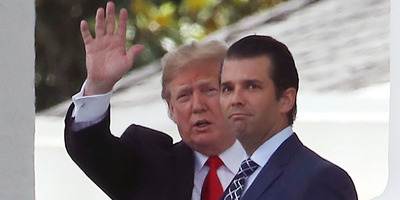 President Donald Trump’s eldest son Donald Trump Jr. told NBC News that he wouldn’t rule out his own run for office sometime in the future. Trump Jr., a senior executive at the Trump Organisation, has been travelling the country in recent weeks campaigning for Republicans in hopes of boosting the GOP’s chances of retaining the House and Senate in the upcoming midterm elections. He added however, pointing to past speculation, that his potential bid for office would not be for New York governor, saying the job is “not really of that much interest” to him. Last year, Trump Jr. told the Associated Press that he would not challenge Democratic New York Gov. Andrew Cuomo, though he signalled that he could be interested in a future run for office. Such speculation about a possible run for office first emerged after the president’s son spoke at the 2016 Republican National Convention in Cleveland. Lawmakers highlighted his speech as one of the best they heard during the weeklong event.